Many pet stores make it seem like you can just buy a betta, toss it in a bowl, and feed it occasionally to have a healthy fish. The reality is that bettas need tanks that are at least 2.5 gallons with frequent water changes, and tap water can kill them because it includes toxic chemicals like chlorine and ammonia. That’s where water conditioner comes in. Add a few drops (actual dosage will vary, so be sure to read the label) of water conditioner to tap water before adding it to your betta tank for the first time or after a water change. 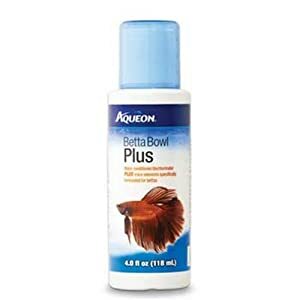 This will help protect your betta from harmful chemicals that can be found in tap water and keep him healthy and happy for many years to come. 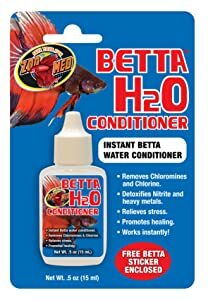 With so many products to choose from, how do you know which is the best betta water conditioner? What is the Best Water Conditioner for Betta Fish? How Much Water Conditioner for Betta Fish? Here is a table about the best water conditioners for betta fish available on the market today. When used as directed with other best practices for taking care of bettas, this is a great product for making tap water safe for your fish. It detoxifies ammonia and neutralizes chemicals like chlorine, chloramines, and heavy metals to create an ideal environment for your fish. In addition, it adds a protective slime coating to your betta, which helps him fight off diseases and parasites. This product leaves your tank clean and your fish healthy and happy. It’s more concentrated than other water conditioners, which means you can use less and still get great results. Even though it’s marketed for use with bettas, it can be used for all tropical fish, which is a bonus if you have other tanks with fish besides bettas. Tetra has been a trusted name in fish products for decades, so you can trust them to make quality products for all of your fish’s needs. This product not only helps neutralize tap water before adding it to your betta tank, but it also contains aloe vera and green treat extract, which reduce inflammation and help to heal fish with powerful antioxidants. That gives this product an edge over other water conditioners. It’s made with a special polymer which creates a synthetic slime coat to help protect your betta fish from disease and stress. You can use this water conditioner to start a new betta tank or just to replace the water in your current betta tank, which is convenient. API has been creating quality products based on research for fish hobbyists of all kinds for more than 50 years, so they have the experience necessary to create stellar products that you can trust with your betta fish’s life. All of their products are designed to work together to keep your fish’s tank in optimal condition. Designed specifically for small tanks with no filtration systems, this is a pretty good value for a water conditioner. Many reviews say this product works fine but isn’t as good as some other products, and the tiny bottle is only suitable for occasional water changes in very small bowls or tanks. In addition to making tap water safe for bettas, this product also has trace elements which help promote good health, bright color, and natural slime coat protection. This water conditioner is made in the United States, so you don’t have to worry about contamination from some factory in China with poor oversight. Overall, this is a good product, but it isn’t necessarily the best value. Other products offer the same benefits but are more cost-effective. This product helps prevent gill destruction, tissue irritation, and fish death. It includes aloe vera and tea tree oil to help heal fish and reduce inflammation. The aloe vera and tea tree oil set API products apart from others. These natural ingredients can help your betta fish thrive. Since the instructions for this formula state how many drops to use per small unit of water, it is easier to use in smaller tanks than products that call for a certain number of measuring spoons per gallon. It’s a great value and can be used for any tropical fish. 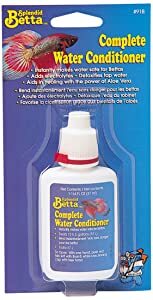 This water conditioner is more concentrated than some other brands, so you can use less each time you change your betta water. It works instantly to detoxify nitrites and other heavy metals while relieving stress and promoting healing. It comes in a handy dropper bottle, which can be easier to use than trying to measure out small measuring spoons. It is a little pricier than other water conditioners, but it may still be a good value since it’s more concentrated than some other brands. 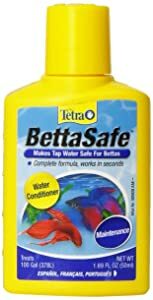 Tetra BettaSafe is the best water conditioner for betta fish. It neutralizes ammonia, chlorine, chloramine, and heavy metals while adding a protective slime coating to your betta. It’s more concentrated than some other water conditioners, so you wind up using less. This product keeps fish healthy and tanks clean. Tetra has been a top, trusted name in fish products for decades, so you know they have quality products. Many customers rave about how great of a product it is. Tap water contains chemicals that are harmful to your betta fish, and distilled water is lacking minerals that are beneficial to your betta fish. 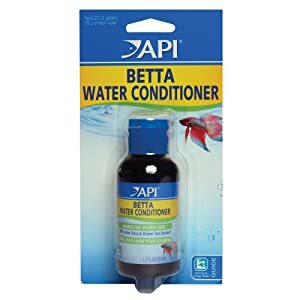 Every time you add water to your betta tank and every time you clean out the tank and replace all the water, you need to add water conditioner to tap water to prepare the water to be safe for your betta fish. Generally, you want water to be room temperature before adding it to your betta tank. It’s best to prepare new water for your betta fish tank a few hours or even the night before adding it to the aquarium so that it can warm up or cool down to room temperature before being added to your tank. Fill a large pitcher or bowl with the amount of water you plan to add to the aquarium and add water conditioner according to the directions on the bottle. Many formulations suggest adding ½ teaspoon of water conditioner per gallon of water, but directions will vary from product to product. Before adding the new water to the bowl or tank of your betta fish, you should fill a small container with “old” water from the tank. Gently scoop your betta fish out of the tank using a small fish net and place him in the container filled with “old” water, then remove the desired amount of water from the tank and add the new, conditioned water. When it’s time to replace all the water and clean the tank, be sure to rinse off the gravel, tank, and any decorations with very hot water but NO SOAP. It’s almost impossible to completely rinse off soap residue, which can kill your betta fish. After you place the gravel and decorations back in the tank, allow them to cool off before adding the new water. For best results, use a thermometer after adding the new water to the tank to make sure it matches the temperature of the “old” water that your betta is in. Now you can gently scoop up your betta with a small fish net and put him back in his tank with the fresh, conditioned water. Each formulation will have instructions for how much water conditioner to add for the best results. Typical instructions are to add 8 drops of water conditioner per pint of water, 16 drops for a quart of water, and half a teaspoonful per gallon of water, but always check the packaging for that product’s directions since some products are more or less dilute than others. Adding too much of a more concentrated formulation or too little of a more dilute solution can be deadly to your fish. Adding water conditioner to the tank of your betta fish is a crucial part of keeping him alive and healthy. You need to use water conditioner any time you add water to your betta tank. On average, you should replace 25% of the water in your betta aquarium at least once a week, and you should replace all the water about once a month. Smaller tanks will require more frequent water changes since they typically don’t have filters to help clean the water, and larger tanks will require less frequent water changes since waste is disbursed more easily and can be captured by using water filters. Keeping your betta water clean and conditioned is a critical part of keeping your fish alive, healthy, happy, and active. Tanks that are cleaned too infrequently are a common source of sick fish, so when in doubt, change the water more frequently and follow the directions on the bottle of water conditioner to ensure you’re using it properly. With a little bit of work and the right betta water conditioner, your betta can live for many healthy years.